Whether beach holidays or city tours, sport or romantic vacations – the most important thing is a nice accommodation. To many people a perfect holiday means to be pampered, don’t have to worry about anything and just enjoy the stay. Clean rooms, catering and a friendly staff are things, which you can expect from a hotel in general. Nevertheless – or precisely for that reason – many hotels offer much more: Here it is all about luxury, comfort and extravagance. Guests are given an incomparable holiday, where nothing is left to be desired. Actors, athletes and Co are able to afford such a lifestyle during the whole year. Everybody else has at least the vacation to make a dream come true and to feel like a star once per year. 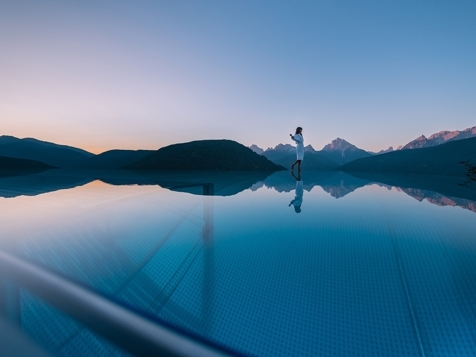 Nestled in beautiful landscapes and equipped with every imaginable luxury, the five star hotels in South Tyrol are the ideal place for you to enjoy a very special holiday. With five stars, a hotel has reached the peak in its sector and it is no exaggeration, when they claim to belong to the best, classiest and most luxurious accommodation structures in the world. And the guests, who spend their holidays in such a hotel, must get an idea of how it is like in paradise. Cause that’s how you’ll feel, when you relax in the whirlpool after a soothing massage and the service attends to every whim and fancy. That sounds like there would be a huge spa area in the hotel, right? But that’s far from it: Many five star hotels in South Tyrol offer a sauna, a jacuzzi and even more in their spacious suites. The meals can also be served at your room if you’d want it, although “meal” isn’t the right term for an exquisite 5-course-menu. Of course, all the stuff knows about your preferences, any food allergies and similar stuff. No matter which other wishes do you have – they’ll be fulfilled. To be rated as a five star accommodation is not an honor, which is given to you once and then lasts for ever. The five star hotels in South Tyrol are constantly striving to meet the many requirements and even to offer more. If you are looking for the cream of the crop for your holiday, you couldn’t make a better decision! Here you can find a selection of 5 stars hotels featured on our website suedtirol-hotels.com!